The senator with the lowest job approval doesn’t think he’s the problem. He’s trying to stir up resentment toward public employees and their unions. After spending the better part of a decade obstructing majority rule in the US Senate, and preventing the Congress from acting on fundamental issues that are of concern to the great mass of Americans, Senate Minority Leader Mitch McConnell has figured out who is to blame for mistrust of government: public employees and their unions. McConnell even went so far as to suggest that unions are to blame for inappropriate targeting for extra scrutiny of requests for charity exemptions from groups with Tea Party ties. The senator has also suggested that President Obama’s criticisms of conservative groups influenced choices made by IRS employees. So why is McConnell bashing the NTEU? 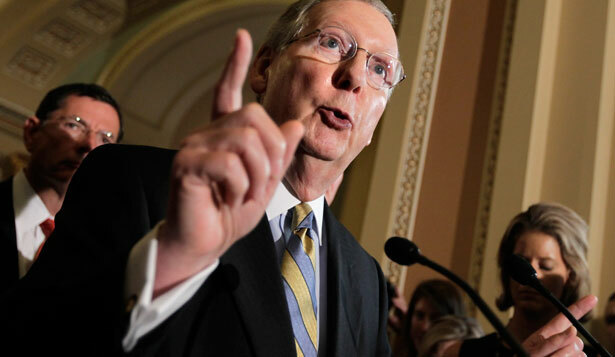 As NTEU President Colleen Kelley told The Hill, the senator “has long…opposed the existence of public sector unions.” NTEU is not the only target of McConnell’s wrath. He’s generally upset with public-sector unions: the American Federation of Government Employees; the National Weather Service Employees Organization; the American Federation of State, County and Municipal Employees; the International Association of Fire Fighters… you name it. In fact, the NTEU recently led the fight on a host of high-profile customs and border security issues, seeking to maintain operations at US airports, seaports and land border crossings in this period of sequestration. The union has fought to maintain the federal Food and Drug Administration’s “vital, complex public health responsibilities, that include safe food, medicine and medical devices, cannot be accomplished with this level of funding.” It has campaigned for cost savings by seeking approval of a plan to “reduce substantially the amount taxpayers have to pay in salary reimbursements for government contractors.” And it’s been in the forefront of efforts to protect whistleblowers and to promote transparency. It is true that NTEU and other federal, state and local public-sector unions defend the interests of their members. That’s what labor organizations do. But when McConnell and his minions imagine that federal unions have no concern for the public interest, they miss the reality that these unions are often the loudest and most determined defenders of programs that most Americans consider to be vital. When they imagine that public-sector unions are the source of general frustration with dysfunctional government, politicians like McConnell neglect the polling that shows approval of Congress has fallen to historic lows. According to the Real Clear Politics summary of recent polls, only 14 percent of Americans approve of how Congress is doing its job. The disapproval rate is 78 percent. Noitably, when voters in states across the country were polled regarding their congressional representatives, the senator with the lowest net job approval rating was… Mitch McConnell. Giant corporations are in agreement with Mitch McConnell when it comes to unions—Walmart just fired eleven striking workers who were organizing with OUR Walmart.